Trench 2B at Tarradale during excavations in October 2017. 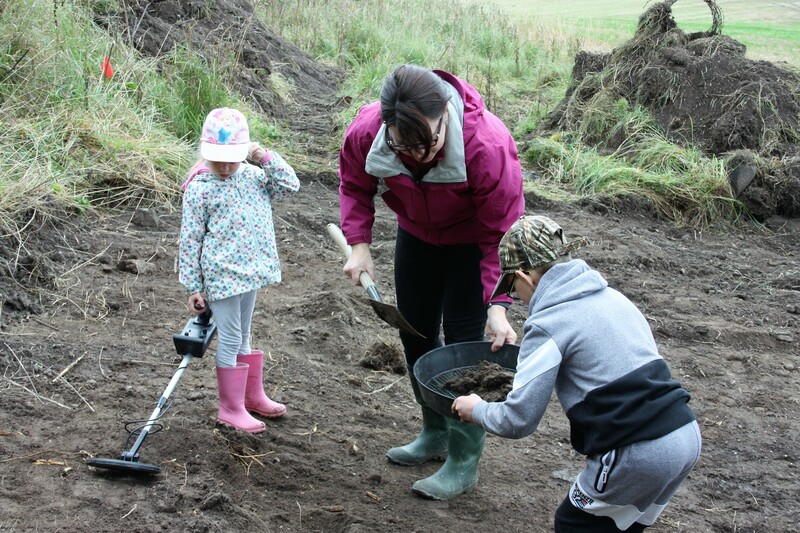 This blog sets out some of the recent developments in the TARRADALE THROUGH TIME project (see website), a NOSAS led project that commenced in 2017 and is supported by the Heritage Lottery Fund and Historic Environment Scotland and private donors. TARRADALE THROUGH TIME grew out of the earlier Tarradale Archaeological Project which is still ongoing as a mainly field walking and data gathering exercise – see Tarradale Archaeological Project blog . 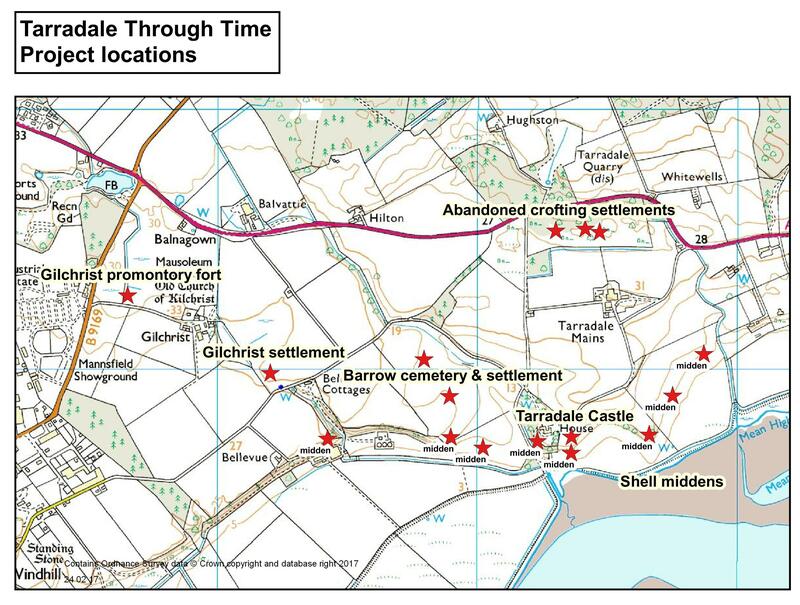 Field walking over the last few years has produced a great deal of data which has been recorded and mapped and the patterns emerging from mapping and analysis suggest that there were several important archaeological sites within the Tarradale study area that merited further investigation. A detailed research project was drawn up as a multiperiod investigation and given the name of TARRADALE THROUGH TIME. The sub title of the project is community engagement with archaeology in the Highlands, as one of the aims of TARRADALE THROUGH TIME is to engage with the local community in order to widen access to heritage through research and understanding and to underline the premise that archaeology belongs to the community and not just to the archaeologists who explore it. The Tarradale Through Time website can be found at www.tarradalethroughtime.co.uk. 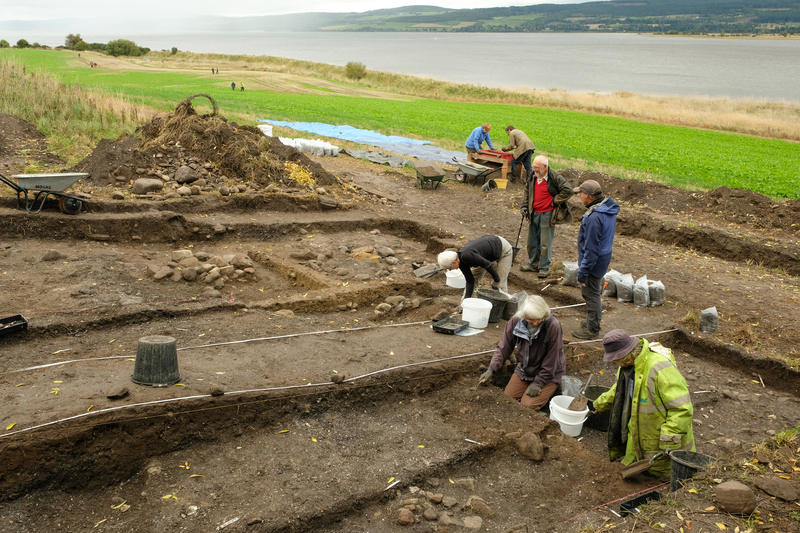 Community volunteers at the Tarradale castle site excavations, September 2017.
surface survey and investigation of deserted postmediaeval agricultural townships or settlement clusters. This entry was posted in Black Isle, Excavations, Medieval, Mesolithic, Pictish, Post Medieval, Surveying and Recording and tagged antler T axe, antler tine, antler tools, AOC Archaeology, archaeology highlands, Balvattie, Barri Jones, Beauly Firth, biserial barbed antler point, Black Isle archaeology, ditched enclosure, field walking, kettle hole, magnetrometry, mailers, medieval horse harness, mesolithic archaeology, motte and bailey, North of Scotland Archaeological Society, promontory fort, radiocarbon dates, raised beach, shell midden, Tarradale Archaeological Project, Tarradale barrow cemetery, Tarradale Castle, Tarradale HLF funding, Tarradale House, Tarradale Through Time, test pits on March 22, 2018 by nosas.